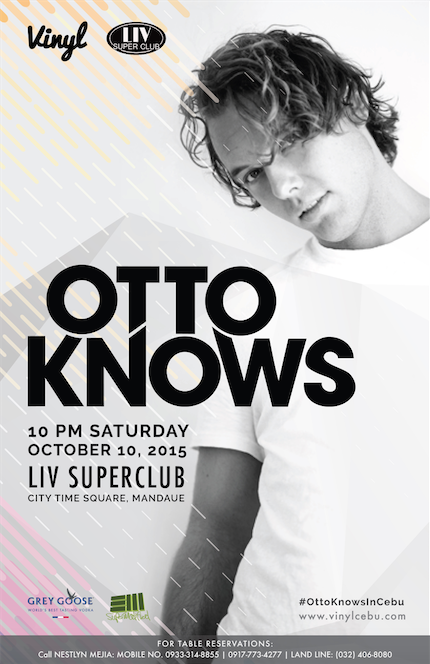 Vinyl Entertainment Cebu and LIV Superclub announces a special live performance of International DJ Producer, Otto Knows. The Swedish artist will be performing live for the first time in Cebu on Saturday October 10, 2015. Known for his global hit single, 'Million Voices', Otto Knows is part of Sweden's most talented and gifted exports of DJs and Producers. Brought to the attention of Sebastian Ingrosso thanks to a chance meeting in their native Stockholm, his development as a DJ and producer came through the first hand experience of touring alongside the Refune head honcho. Debuting alongside none other than Tim Berg and Swedish peer Oliver Ingrosso, the time between ‘iTrack’ and his breakthrough single ‘Million Voices’ was a period of considerable development under the watchful eye of Sebastian Ingrosso. Created in the back room of the studio whilst Ingrosso and Alesso penned festival favorite ‘Calling’, ‘Million Voices’ would propel the young producer forwards, proving a consistent favorite both across the airwaves and on the white isle of Ibiza ever since and setting the benchmark for his productions at an all-time-high. Receiving widespread attention ‘Million Voices’ crossed over into mainstream consciousness, topping the Shazam chart and being added to the prestigious A playlist at BBC Radio 1, reaching a surge of new fans with each airing. It has since charted in the top 15 in the UK singles chart and gone gold in in Australia, Belgium, Holland and the producer’s native Sweden, while Otto Knows was named one of international tastemaker Pete Tong’s ‘Young Stars’. ‘Million Voices’ has all the hallmarks of a future classic and has undoubtedly signaled the arrival of a new producer who you can be sure will be bringing a lot more to the table across the global dance floor for the foreseeable future. Having recently released his new hit single ‘Next To Me’ Otto Knows looks to continue his presence globally. and my another favorite, cmon! I also love his Tomorrowland 2015 spin! Follow the Vinyl Entertainment Cebu social media accounts to be updated on special offers and upcoming events.